Create a cute yet creepy cranium candy to show appreciation to your Halloween host or hostess at the next ghoulish get-together! Walnut brain candy skulls make a great and gruesome gift for Halloween when you package them in a candy box for a petrifying presentation. 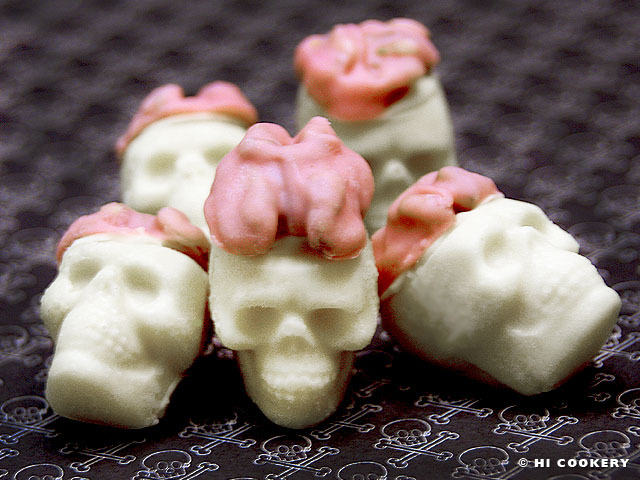 The small sweet skeleton heads are molded from melted white chocolate and the “brains” are walnut halves coated in pink confectioner’s candy. At Halloween parties, these tiny treats are truly good to eat! Melt the white candy according to the pacakge directions (microwave, double boiler, etc.). Stir until smooth. 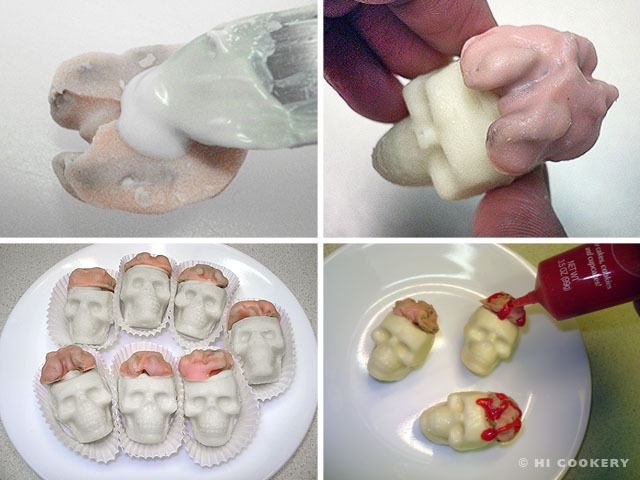 Spoon into the cavities of the mini-skull molds. Refrigerate to set. Unmold the skulls. 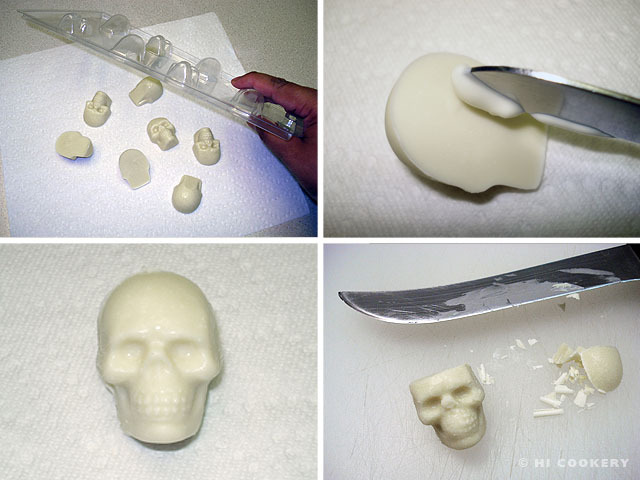 Using melted white candy, spread some on the back of one half of the skull and “glue” together with the matching half. Refrigerate to set. Slice the top of the skull with a sharp knife. It may be necessary to use melted white candy to glue the halves back together. Melt the pink candy according to the package directions (microwave, double boiler, etc.). 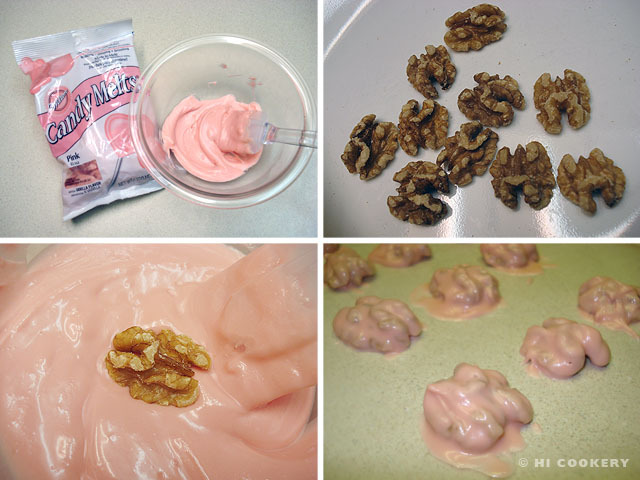 Brush the crumbs off the walnut halves and immerse them into the melted pink candy. Place on a sheet of waxed paper to set. Spread some melted white candy on the pink walnut “brain” and attach it to the top of the sliced-off skull. Repeat with the remaining brains and skulls. Refrigerate to set. Place in mini-cupcake papers. Drizzle red gel icing to look like “blood” (optional). White chocolate has an ivory/light yellow color to it. For whiter skulls, use white confectioner’s candy wafers or melts, which can be found at local craft and hobby stores. Add a few tablespoons of vegetable shortening to the melted candy for a liquid consistency. It helps to make it smoother and easier to pour into the chocolate molds. 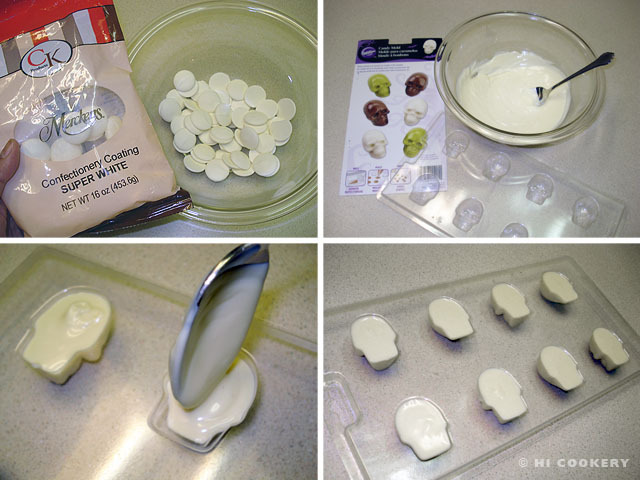 We used the Wilton brand 3D skull candy mold for this blog recipe post.